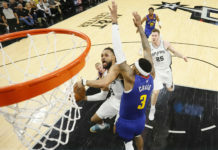 The Denver Nuggets hosted the Los Angeles Clippers for the second half of TNT’s Tuesday night double-header. The Clippers ultimately spoiled the highly-anticipated return of Paul Millsap as they completed a monster second-half comeback and walked away with a 122-120 victory over the Nuggets. The start of this game featured sloppy play and an uninterested crowd. 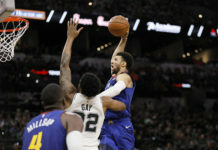 One of the most important games of the season lacked energy and one could hardly have guessed that the season tie-breaker and crucial ground in the playoff race were on the line. In the first four minutes of play, Denver turned it over three times and only made two baskets. Nuggets star center Nikola Jokic picked up two early fouls and Michael Malone was forced to make his first substitution a little earlier than he hoped. This time though, Malone was able to turn to a player who has been unavailable to answer such a call for the last 100 days. 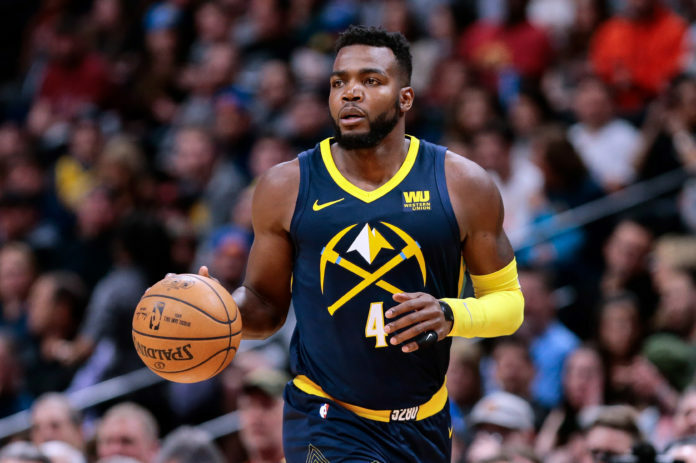 With 5:57 remaining, Paul Millsap checked in to the game and he was met with a thunderous ovation from the Nuggets faithful. The Nuggets would go on a 20-8 run from that point forward. Millsap scored his first points of the game on a layup with about three minutes remaining and that gave Denver their first lead since the game’s opening basket. The Nuggets held the lead for the remainder of the quarter and the score read 33-24 after the first 12 minutes of play. The second quarter featured a 6-0 run from the Clippers after the horn, but Denver would respond with an 8-0 run of their own — including six straight points from Will Barton in less than 60 seconds of game time. 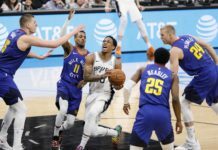 The Nuggets held the lead for the entirety of the second quarter — the most notable moment of which came with 5:17 remaining when Gary Harris checked into the game. That gave Denver a five-man grouping of Jamal Murray, Gary Harris, Barton, Millsap and Nikola Jokic — which could very well be the starting unit once Millsap’s reintegration is complete. That group wasn’t on the floor together long as Wilson Chandler and Mason Plumlee checked back into the game shortly after. As the two teams entered the locker rooms of halftime, Denver held a 58-52 lead over Los Angeles. The Nuggets young core of Murray, Harris, and Jokic combined for just nine points on 4-8 from the field but Will Barton picked up the slack with 19 points in 22 minutes. Millsap was a +12 off the bench with seven points, six boards and two blocks in 13 minutes of action. The third quarter featured a reinvigorated Jokic. After taking zero shots and scoring zero points in the first half, Jokic dropped 10 points in the first six minutes of the third, and finished the quarter with 13 total points. As Jokic began to exercise his will, Clippers head coach Doc Rivers made an adjustment — but it was the wrong one. The Clippers began to double-team Jokic in the post — precisely what Denver wants — and the floor opened up as Denver’s best passer picked them apart with surgical precision. Denver outscored the Clippers in the third, but only by one, and they carried an 88-81 lead into the fourth quarter. Things were looking good for Denver after three, but the tables turned quickly and drastically as the final quarter of play began. The Clippers jumped out to a 15-4 run in less than four minutes thanks to some stellar play from their bench — particularly the larger than life Boban Marjanovic who finished the game a ridiculous +27 in just 15 minutes — and Malone called his second-to-last timeout with 8:19 remaining. What followed was a furious push from Denver’s young back court — Murray and Harris — as the two guards scored 10 straight points for Denver to help the Nuggets tie the game back up. While this sentence may read as if it belongs in a piece better suited for satire than beat reporting — the game began to slip away from the Nuggets in the final minutes as they simply could not stop Marjanovic. A game that once featured a 19-point lead for Denver was in danger of slipping away from them. At death’s doorstep, the Nuggets would make one final push. They fought hard and somehow trimmed the lead down to three with less than 10 seconds remaining. The Clippers opted to foul Jamal Murray to prevent a game-tying three. Murray sank both free throws. On the ensuing possession the Nuggets fouled Austin Rivers on the inbounds pass. Rivers clanked the first one off the rim and drained the second to leave the door open just a crack for Denver — who now trailed by two. Murray drove to the rack probing for an angle, but he lost the ball on the drive and the Nuggets lost the game 122-120. Following the loss, the Nuggets fall to 33-28 on the year, 24-9 at Pepsi Center, and outside the playoff picture after swapping places with the Clippers in the standings. The Nuggets will have two days off before they hit the road for a Friday night game in Memphis. That game tips off at 6:00 pm MT.